Day 10 was supposed to be a whirlwind day leaving Boston at 6am, lunch in New York City, dinner in Philadelphia, and then we would arrive to our hotel in Washington DC at about midnight. On our last night in Boston, Amtrak called us to let us know that our trip to Philadelphia for the next day had been cancelled because of the latest “polar vortex” to come through the area. Corbin had begun feeling pretty bad, so we decided to skip New York City and Philadelphia to head straight to Washington DC early to avoid the weather. Also so he would have a bit longer to recuperate. Between Boston and Washington D.C. our train went right through the snow storm! It was very exciting to feel the train going through the snow and see it swirling all around outside our windows. The vestibules between the rail cars were filling up with snow through the cracks so much that the attendants were having to shovel it just so we could get from car to car! In keeping with our great luck as far as weather went for us on this trip, by the time we arrived in DC that afternoon sun had come out after the storm and the taxis were just beginning to get through the snowy streets. We arrived at our hotel at about 4pm. Fortunately, there was a pretty decent restaurant in our hotel so we didn’t have to get out and try to get around in the snow. On day 11 Corbin was still feeling pretty rotten, but he wasn’t running a fever so we decided to do one of the hop on and hop off bus tours around the city as a leisurely sightseeing tour instead of visiting any museums etc. Most of the city was shut down due to the weather, which meant that we were pretty much the only ones on the tour, so I didn’t feel like I was exposing strangers to his cooties or anything. That night we did the night tour on the same bus which was amazing. Due to black ice on the paths up to the statues, Grandma and Doris stayed on the bus. Since Corbin’s stomach was still really crampy, I was on my own taking more close-up pictures. Day 12 was quite a turning point for Corbin’s little stomach bug and we made up for the low-activity of the past few days, by running around the city doing everything we had time to do before our train left that night. Grandma and Doris Marie waited with our luggage in the train station so we could get through more things at a little quicker pace. Corbin’s #1 desire in DC was to visit the National Air and Space Museum. It did not disappoint! We also wandered around the Capitol playing in the snow for a little while. We got some dirty looks from security guards, but they didn’t stop us from having some fun! 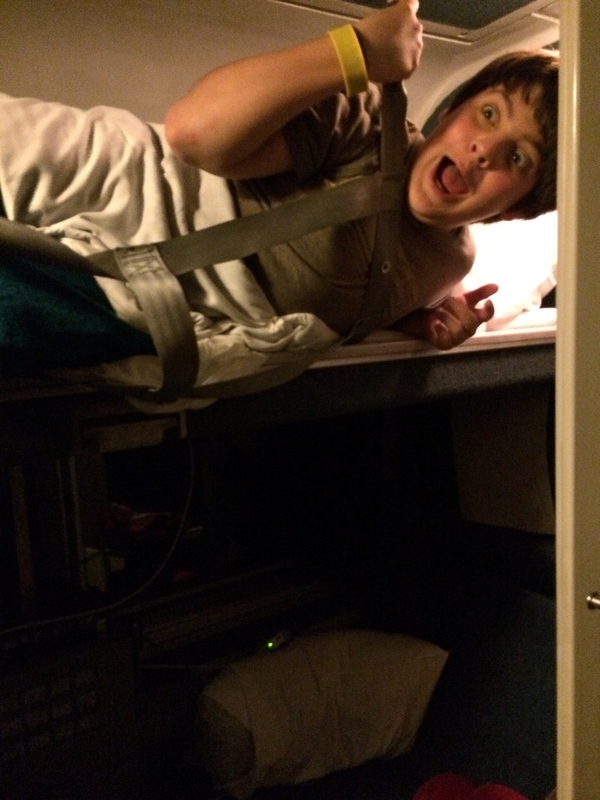 We woke up somewhere around Cleveland, Ohio on Day 8 in sleeper cars on the Lake Shore Limited. 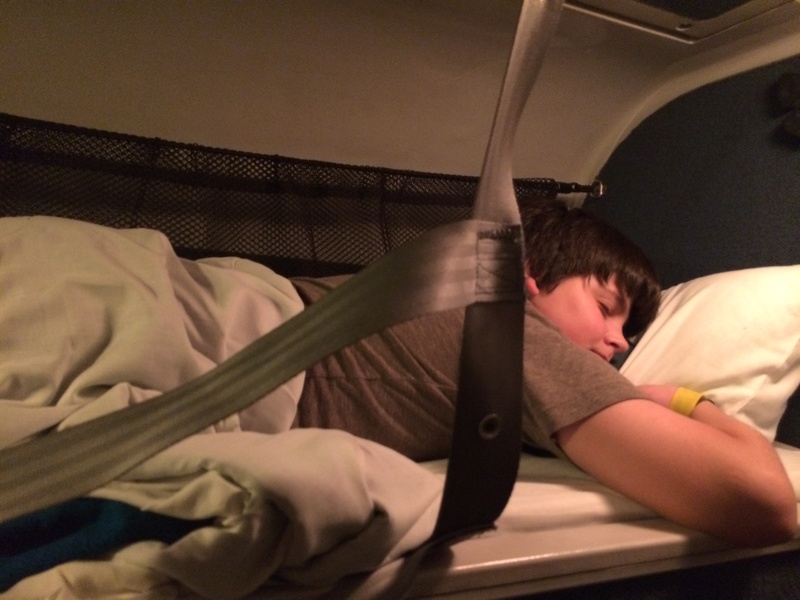 Corbin and I were in a roomette, Grandma and Doris were in a bedroom. Something interesting about our roomettes was that they had little secret toilets and sinks in the stairs to the top bunks right in our roomettes. It was cool, and disturbing. They don’t stink or anything, they seemed very clean, it’s just the thought of sleeping inches away from a toilet that was a little odd. Grandma and Doris’s room had a toilet/shower in it, which is exactly what it sounds like. You can just sit right there on the potty and take a shower if you feel so inclined. The only real drawback is that you really have to be careful because everything in the bathroom when you take a shower gets wet – including the toilet paper. The room was pretty cool though. Corbin spent most of the day sitting in there with them, and I sat alone in the roomette just reading and enjoying the quiet comfort. One thing you will notice is that we have very few decent pictures from the train between Chicago and Boston because the windows were extremely dirty. It was like the train had been muddin’ or something. Anyway we all really enjoyed seeing a part of the country that none of us had ever laid eyes on. Seeing a bunch of snow-covered everything was very impressive to us Texas folks. We arrived into Boston at about 9pm and went right to our hotel. We were kind of swindled by our first Nigerian cab driver, so when we arrived at our hotel we were feeling all happy and quite proud of our urban accomplishments. After all, we HAD just maneuvered ourselves all the way across the country using public transportation! That’s quite an achievement for some born and bred Texans who had previously never even stepped food on a city bus! Our hotel was truly amazing. The Omni Parker House hotel is said to be the oldest continuously operating hotel in America. Chefs in it’s restaurant are also credited with inventing the Boston Creme, and Lemon Meringue pies. It was beautiful, and the staff was wonderful. Corbin was super excited that there were hotel bathrobes. On day 9 we woke up and headed out for some history tours! We walked with Grandma and Doris and left them at Faneuil Hall which is next to Quincy Market and bunch of other shops and restaurants they could explore within a close proximity. Corbin and I headed to Boston Common to join a walking tour. This tour was truly the highlight of our whole trip. We thought the tour would follow the Freedom Trail which is a 2.5 mile walking trail that directs you around to a ton of historical sites through Boston. You can easily find it because they have laid a red-brick path that you just follow and read the information. Our tour guide said that he believes this trail was actually created by the local Chamber of Commerce to connect the Dunkin’ Donuts stores to one another. So he took us a different way, but we saw all of the same things. I really can’t explain how great this tour was from a homeschool perspective. In about two hours, Corbin and I both have a grasp of the history of our country that I don’t think we could have received in years in a classroom. Walking through the sites really connected the dots and made the history just click into place. After the tour, we met back up with Grandma and Doris Marie to have lunch at Durgin Park restaurant which was founded in 1827. We didn’t realize while we were there, but our waitress was supposed to be surly and rude to us. I guess she figured we looked like a no-nonsense bunch of folks, so she was quite kind and helpful. The food was great. I had a lobster roll with genuine Boston baked beans! They served some excellent cornbread. I don’t usually like sweet cornbread, but it was really good. The only drawback with this meal was that Corbin credits it with the beginning of what would be a really bad stomach bug that lasted over the course of about 4 days! After lunch we walked over to tour the Paul Revere house. We were amazed at what an awesome guy Paul Revere was! History has not given him enough credit I think. We visited a few other graveyards and sites near our hotel and then went in for the evening around dark. Corbin had started feeling bad, and we were all tired. Since the hotel was famous for the Boston Creme pie, we splurged and ordered some from room service. It was so good, even more so since we enjoyed it in our jammies! Like I said before, Boston was truly the highlight of our entire trip. I felt so close to our country’s history there. We will be going back there soon. We saw so much, but I know we didn’t even scratch the surface! On day 6 we woke up in Grand Junction at my great aunt and uncle’s house. The night we arrived several of our extended family members who live in the area joined us for a really fun dinner. We have a really big family, and these are some of our favorite family members whom we don’t get to see enough of, so it was an extra-special visit! I know I keep going on and on about the views on this trip, but folks, America is amazing. That’s just all there is to it. Every day there were so many different landscapes that your brain just has trouble understanding them. These two days were some of the most amazing ones we witnessed on this trip. The California Zephyr is notoriously late, but it is also said to be the most scenic stretch of rail in America. I’m going to have to agree with the assessment that it is the most scenic. As far as the lateness, while we arrived to Grand Junction three hours behind schedule, the next time we boarded the Zephyr we arrived to Chicago about an hour early. So our experience was mixed. We spent a pretty restless night in coach seats again on Day 6, but we had plenty of time for napping and lounging on Day 7 before we arrived in Chicago at about 1:30pm. We walked over to The Willis Tower (formerly the Sears Tower), and went up on the Sky Deck to see a gorgeous birds-eye view of Chicago. It amazed us to see that Lake Michigan was iced over! Corbin bravely went out on the glassed in ledge. After visiting Chicago for just a few hours, we went back to the train station to have a quick dinner before boarding the Lake Shore Limited that night at 9pm. I’m happy to report that I have now eaten a real Chicago hotdog. The next section of the trip between Chicago and Boston would take us about 24-hours so we decided to upgrade to the sleeping cars again for this leg. I wish I could post every picture we took today. I whittled it down as much as possible. The beauty of the coast of California completely blew my mind. Our day began at 5am when our train arrived into Union Station in Los Angeles over an hour early. We were overjoyed to have the extra time to spend in Los Angeles before we had to catch the Coast Starlight for the trip up the coast to San Francisco. Our plan was to catch the Red Line on LA’s subway system, travel down into Hollywood to see the Hollywood sign, and return back to Union Station by 10am to catch our connection. Unfortunately that didn’t work out so well. We missed our stop on the subway, and then were separated from Grandma and Doris Marie who were left standing on the subway platform when the doors closed while we were inside. That experience scared all of us because if we would have been separated we might not have been able to find each other in time for our connecting train. We decided to head back to Union Station and explore that area instead. That adventure turned out to be a huge blessing because we were able to check out Olvera Street which happens to be the oldest street in Los Angeles! We were there before all of the little shops opened, but we were able to see some of the famous murals, and read a bit about the history of the area. We also saw the oldest standing residence in Los Angeles from 1818, the Avila Adobe. Despite California’s drought, this whole area was lush with some amazing trees, and flowers of all kinds. It’s definitely a place I would like to visit again – next time during business hours! Despite all of the beauty we saw today, we saw some other things that were a little bit disturbing. There were so many homeless people living along the train tracks. Often they were even right behind the back fences behind people’s homes! I’m sure many of them were actually people who had come into the country illegally looking for work in those produce fields we saw. Whether they were there due to California’s hard-hit economic times, or illegal immigration, it opened up a dialogue to discuss with Corbin some of the realities that people endure which we don’t usually see. I ended this day feeling deeply blessed and humbled. We arrived in Emeryville at 9:30pm tonight. Our hotel was just across from the train station, so we walked over there and crashed for the night. Tomorrow we will be headed east. 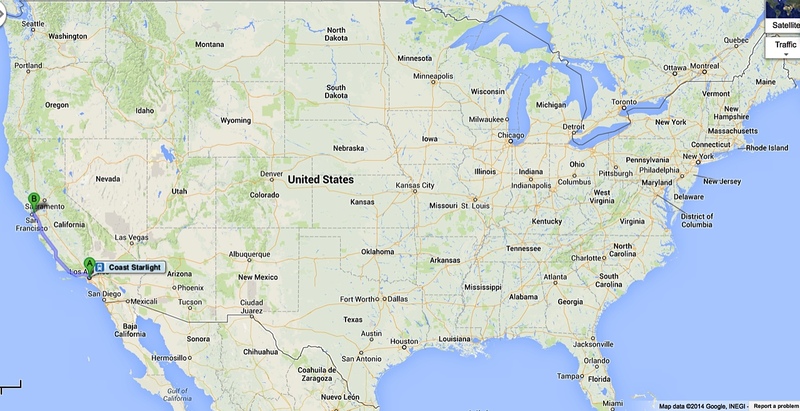 Our next stop will be Grand Junction, Colorado! Here’s Corbin’s post about this day. In case you are interested. We were the first people sitting in the dining car for breakfast this morning. The food (pancakes and strawberries) was great again. After breakfast we visited the observation car for a little while, but it was a pretty hazy sunrise so we decided to go back to our roomette to enjoy the scenery from there. Corbin’s photography classes are really paying off on this trip so far! We adjusted the shutter speed as high as our dlsr camera will allow. Right now it’s 3:48pm and I’m laying in the top bunk of our roomette downloading the pictures, and typing this etc. There are just too many great pictures to count! We are supposed to go down to the dining car at 5pm for dinner, but I can’t imagine eating another bite right now. We had some really good hamburgers for lunch. It seems like all we do is eat and sit! We are having so much fun though. It’s indescribably relaxing to just sit and visit while the world rushes past the windows. Today’s highlights were Alpine Texas (Big Bend), and El Paso so far. At this point in our day, our next stop where we are allowed to detrain for a little while will be in Tucson. I’m hoping to find a geocache while we are there since I believe we will be able to get off of the train for an hour. As we passed through west Texas, we were amazed by the changing geography. We spent quite a bit of time listening to the podcasts and trying to figure out which geological features we were seeing. As we rode along the border between Texas and Mexico, it was amazing to see the stark contrast of the appearance of the Mexico side in Juarez vs. the US side in El Paso. There were so many border patrol trucks! Looking down from the second story of the train we could actually see footprints in the sand where people just routinely walk across the border despite the patrols. I can’t even imagine what this area looks like at night with all of the activity we saw during the day! One last thing… so far it seems that we have packed everything we need without overpacking. I’m glad I spent so much time reading all of the Amtrak forums for suggestions about what to bring on board. So far everything has been spot on! Time will tell if this feeling will hold up. To check out Corbin’s perspective of today and yesterday, check out his blog. Today is the day! We are finally headed to the train station to start our trip. 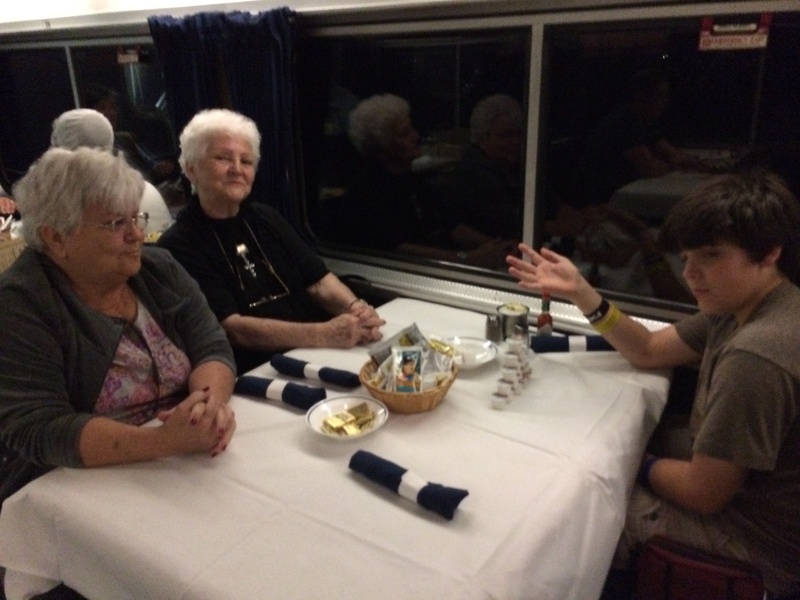 Just after we departed, we were immediately shuffled down to the dining car for dinner. To ensure efficient service, Amtrak requires reservations for dinner, and usually lunch. Since we are a party of four, we all get to sit together. If your group has an odd-number, someone will be sitting with other people. The dining car crew was amazing, and the food was really good. When we went back to our roomettes for the evening, our sleeper car attendant came around to change our rooms from day-time mode to night-time mode. Corbin found this totally fascinating because he had a whole new set of levers and knobs with which to tinker. He immediately said he was tired, and needed to go to bed. It was only 8pm so he was soon back up and bouncing around again. 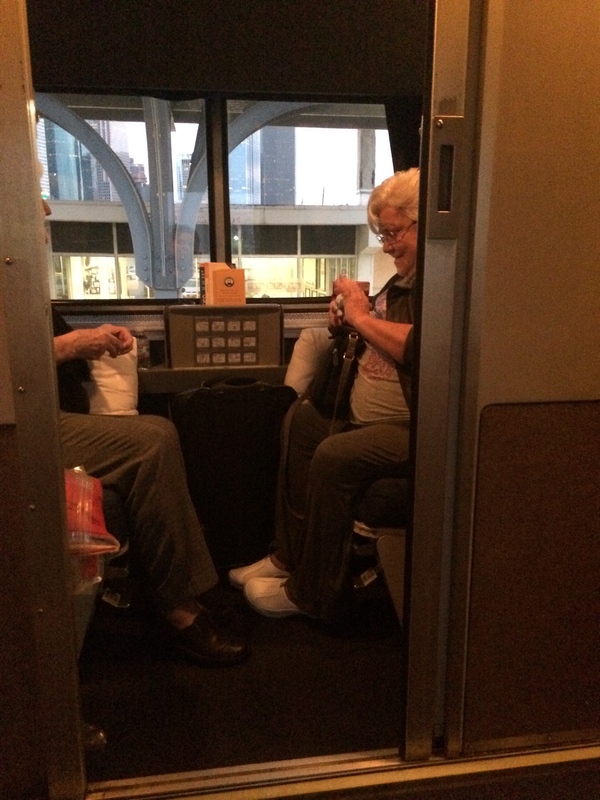 My grandma and her sister’s roomette was just across the hall from ours, so he alternated between the two. On this first night, they taught him to play spades and some other card games. On this first night we didn’t sleep much as we were still learning to regulate the temperature in our roomettes, and get used to the noises and movements of the train. One of the things I was most worried about was motion sickness. I get car sick easily, but the train is a whole other story. I didn’t get sick once on this whole trip! As a matter of fact, I found the motions and sounds of the train quite relaxing. It was very quiet and peaceful with the lights out in the roomette watching the night go by outside the train. 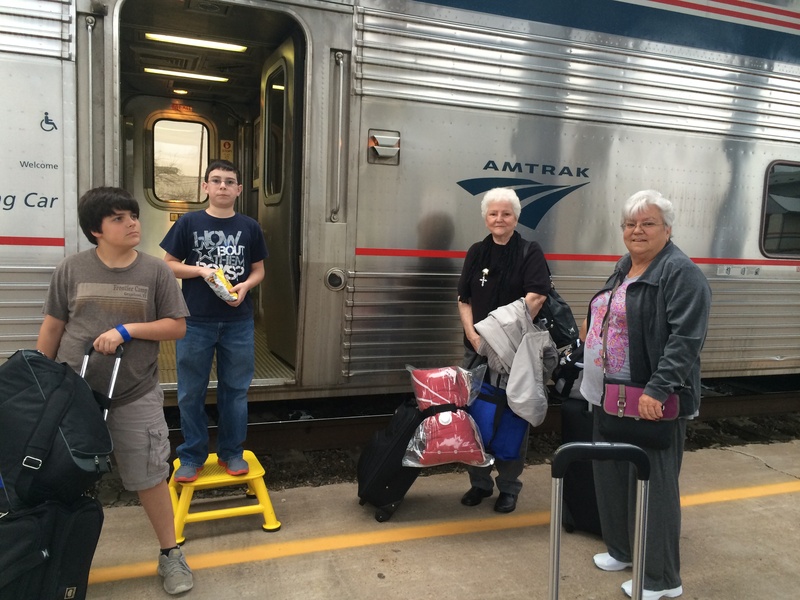 Corbin, Chase, Grandma, and Doris Marie saying goodbye before we boarded the train. A view of Grandma & Doris Marie’s room across the hall from ours. Here’s a (kinda rough) panoramic view from my seat in the roomette. Corbin demonstrating the belts that keep you from falling off the top bunks. Corbin “sleeping”. I actually ended up sleeping on the top bunk for several hours because he finally passed out on the bottom bunk at some point during the night when he finished hanging out and playing cards with Grandma and Doris.